I have to admit that I don’t review a lot of video cables here on this blog, but I have to say that I am very impressed by this mCable from Marseille. I’m going to get this out of the way and say that I saw this product at CES, and I was very impressed by the presenter. Seriously, someone needs to give that guy a raise, because he was so exuberant about his product that he is a model of anyone who makes anything. 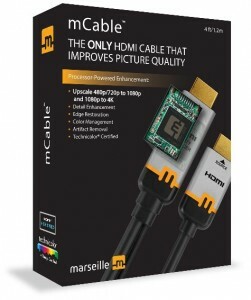 The mCable HDMI Cable brags that it is the only product of its type that improves picture quality. Now, when I saw this product demonstrated at CES, they showed me two separate screens, one with the mCable and one without. It actually does bring sharper pictures, better contrast, natural colors, and crisp edges. If I hadn’t seen the images side by side, I wouldn’t have known the difference. The mCable (M is presumably for Marseille, a region in France) has a video enhancing processor that does its magic. Not only can it improve the resolution of a 1080p or 4K TV, but it can improve the resolution on older models of TV. It is able to upscale 480p/720p to 1080p and 1080p to 4K. I highly recommend anyone who wants a better cable for your television should look into the Marseille mCable and can find out more information on the product on the company website. The 4 foot model can be found on Amazon for $121.50, while the 9 foot version can also be found on Amazon for $149.95.